1. We camped in a "day use only" area. Oops! 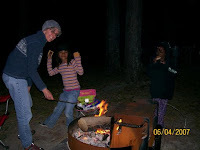 Probably not the best idea to have a big fire and smores there after hours... The second night we were there, a trooper came by and gave me a warning citation, so I'm officially on the black list of the NC Park system. Bummer. He was super nice, though, and gave us good ideas about where else to camp and tips on the local foliage. And most importantly, it was 8:00 PM and he didn't make us strike camp and move. Thank goodness. 2. Saw a guy riding a horse in the ocean! That was a nice treat. He was also very friendly and let us pet the horse. 3. 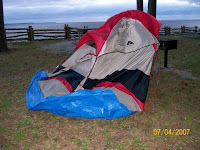 Survived a super-duper windstorm the second night. 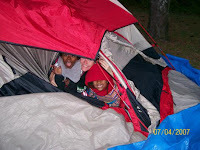 Check out the photos, it's hard to believe that there were 4 of us sleeping in that tent while it was nearly flattened. 4. 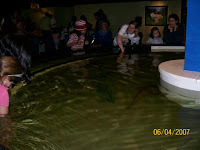 Had a great time at the NC Aquarium at Fort Fischer. Got to touch fish, hear stories about shells, learn about turtles, and much more. Here are ALL the pictures from the trip on Yahoo!